Patricia Jushka, 92, of W Dodge Street in Port Washington, died Monday March 14, 2011 at the Harbor Club in Port Washington where she had been a resident for the past 45 days. 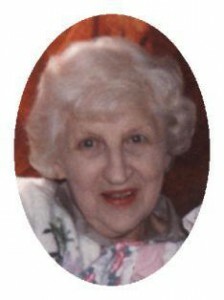 She was born June 1, 1918 in Port Washington to Joseph and Veronica L. Bilius Jushka. A life long resident of Port Washington, Pat attended St. Mary’s School and worked at the Port Washington Chair Factory in her youth until the fire. She then worked as a receptionist and clerical for Dr. Charles Kauth, MD for many years and a couple of years with Dr. Luib, pediatrician. Pat was a longtime member of St. Mary’s Church and Choir under the direction of Harold Ewig and Ann Celeen Dohms. She was also a member of the former Daughters of Isabella and enjoyed crocheting. Aunt Pat was a wonderful caregiver to her parents and many nieces and nephews. She will be remembered for taking them on fun outings and her no scoulding policy. She is survived by her sisters-in-law Ruth Juska, Charlotte Jushka and Jackie Jushka all of Port Washington. Further survived by nieces, nephews, other relatives and friends. Preceded by her three brothers Anthony Jushka, John Jushka and Peter Jushka. The Rev. Thomas Lijewski will celebrate Mass of Christian Burial at St. Mary’s Church, 430 N Johnson Street, Port Washington on Saturday, March 19, 2011 at Noon. Interment parish cemetery. Visitation 10 am – Noon Saturday at church with a 10 am rosary. Memorial to St. Mary’s Church or charity of choice appreciated.